Squeeze the juice of three lemons into your serving bowl. Add olive oil and minced garlic. 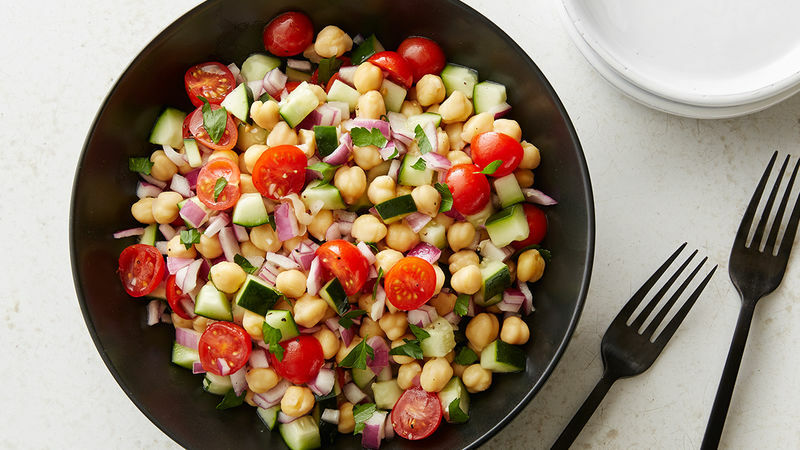 Add cucumber, red onion, cherry tomatoes and chick peas to bowl and stir to combine. Season with salt and pepper to taste. Sprinkle parsley on top to garnish. Refrigerate for one hour prior to serving. If there were a world-wide popularity contest for most consumed bean (can we make that a thing? ), garbanzo beans would win, hands down. As popular as they are, the question still remains: what is the difference between a garbanzo bean and a chickpea? Actually, there is no difference. While garbanzo is the Spanish term for this fiber-packed, slightly nutty-tasting legume, chickpea is the English term. Regardless of what you call them, these versatile little beans are fantastic simmered in a savory curry, roasted as a salty snack, smashed into a delicious dip, or tossed into a fresh bean salad. Needless to say, once you’ve had even a handful of garbanzo bean recipes, you still haven’t had them all.